1. Invoking of the U.S. Constitution. “Along with our freedom to live our lives as we will comes an obligation to allow others to do the same. We don’t live in isolation. We live in a society, a government of, and by, and for the people. We are responsible for each other,” the president said. The right to worship freely and safely- denied to Sikhs in Oak Creek, Wisconsin. The right to assemble peaceably – denied shoppers in Clackamas, Oregon, and moviegoers in Aurora, Colorado. The rights to life and liberty and the pursuit of happiness – denied to college students at Virginia Tech, high school students at Columbine, elementary school students in Newtown, and kids on street corners in Chicago. Surely, libertarians and the pro-gun contingent that sanctify the constitutionally-protected right to bear arms will be outraged by Obama’s pointing to the constitution in his defense for more gun control. He reminds us that our rights are protected, as long as they do not infringe upon the ability of our fellow citizens to pursue and practice those same rights. 2. Making this issue about gun violence as a whole. 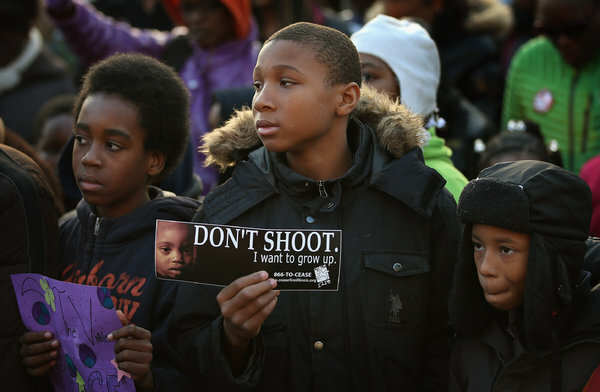 Children at a Chicago peace vigil. Photo by Scott Olson/Getty Images as seen in New York Times. The Newtown shooting is horrendous because of those who were victimized: young, defenseless children with their entire lives ahead of them and educators who had dedicated their lives to enabling those children to reach their potential. However, Obama made it clear that this legislation is about more than one singular, albeit horrifying, act. It’s a response to gun violence as a whole. Obama’s mentioning of gun violence in Chicago, the city where his political career began, makes it clear that his gun control proposals aren’t just a response to rare instances of violence committed by mentally-ill perpertrators. Of the 900 deaths by guns since Newtown that Obama mentions in his speech, at least thirty-one have occurred in Chicago (more by other accounts). In 2012, 442 of 514 homicides committed in Chicago were due to gunshots – roughly eighty-six percent of all homicides. In Chicago, gun violence is closely tied to gang activity and hits certain impoverished communities especially hard. For those communities, gun violence is a daily fact of life, and, unfortunately, has become something that is expected. At the funeral for Chicago’s 463rd homicide victim of 2012, Chicago’s 471st victim was shot to death. This occurred on the steps of the same church “where Obama distributed food to the needy just after he was elected president in 2008,” according to the same article in the New York Times that is linked above. Notably, the majority of the guns used in violent crimes in Chicago are not assault weapons. In just the first two weeks of this year, 7,400 weapons have been confiscated by the Chicago Police Department – only 300 of which are assault weapons. An assault weapons ban will not be enough to decrease gun-related violence in Chicago. Access to guns is surely an issue that police in Chicago will have to tackle, but beyond that, greater efforts must be made by community police to assure that witnesses to crimes do not feel vulnerable after speaking to police. As long as key witnesses to crimes are afraid of becoming victimized after “snitching,” they will be wary to come forth with details that can deter future crimes. 3. Taking a firm stance on assault weapons. One of the weapons used in the Aurora shooting was the legal AR-15, pictured above. President Obama called on Congress to restore a ban on assault weapons that that was passed into law in 1994 and expired ten years later. These weapons “designed for the theater of war have no place in a movie theater,” Obama said, alluding to the Aurora, CO shooting in which one of the weapons suspect James Holmes used was an AR-15 assault rifle. That weapon would have been much more difficult for him to acquire if the assault weapons ban was still in place. Obama said that the majority of Americans were with him on this issue. Obama’s former chief of staff and current Mayor of Chicago, Rahm Emanuel, is also in the president’s corner. Just a few days after the Newtown shooting, he called for an asssault weapons ban not just in the city of Chicago and state of Illinois, but nationwide, urging the U.S. Congress that “It is time to have that vote.”. 4. Emphasizing that this is more than a partisan issue. Former President of the United States Ronald Reagan. Although Reagan was “one of the staunchest defenders of the Second Amendment,” Obama said, he still supported an assault weapons ban. In mentioning Reagan, Obama made an appeal for cooperation in passing these reforms to proponents of gun ownership. Gun control should be something that reaches across the aisle and unites republicans and democrats, instead of dividing them. Obama’s tacit plea for overcoming partisanship aside, this issue has clear partisan leanings. Of the fifty-three U.S. Senators who received a grade of “B” or higher by the National Rifle Association, only eleven of those were Democrats. Only Sen. Max Baucus (D-MO) received an “A+,” compared to nine republican senators who received the same grade. Furthermore, among the thirty-six senators who got an “F” grade from the NRA, the only republican in the group is Sen. Mark Kirk (R-IL). Furthermore, he acknowledges that there will be extreme opposition to his call for more stringent gun control. Obama knows that it will be no easy task for his reforms to be passed into law. He knows that the opposition to an assault weapons ban and more thorough background checks for prospective gun owners is great within Congress and with special-interest groups that pressure legislators. He realizes that passing these reforms is no sure thing, despite the tragedies that have occurred across the country at the hands of gunmen. 6. The absence of creative, technology-driven solutions. Missing from Obama’s plan are innovative solutions to curb gun violence. In addition to banning assault weapons and high capacity magazines, calling for universal background checks and closing gun show sale loopholes, Obama proposes more indirect preventative measures, such as bolstering security in schools and improving mental health services. This aims to answer to the “guns don’t kill people, people kill people” contingent. Those measures may be necessary, but they are mostly obvious. It is hard to believe that in a time when fingerprint technology can be used to access personal computers that the same kind of technology cannot be applicable to gun control. What about safeguards to ensure that only the person to whom a weapon is registered can fire it? Technology for such “smart guns” exists and could have possibly prevented the Newtown shootings. Technology supporting guns that analyze “biometrics and grip pattern” is feasible, and Vice President Joe Biden said the White House gun violence task force was interested in such ideas that could prevent guns from falling into the wrong hands. Although gun vendors are against such technology because it would hamper the second-hand market for weapons, some sort of compromise must be achieved. It seems like common sense to use technology to prevent gun violence while ensuring those who want to own guns for peaceful purposes do not have to sacrifice their rights. Nevertheless, using technology to make sure guns can only be used by those who purchase them was not mentioned in the president’s speech. For those who have been touched by gun violence, Obama’s proposed measures will be justified, though tragically overdue. As for those responsible, law-abiding gun owners and enthusiasts clamoring over how this will be an infringement on their constitutional rights to bear arms – it won’t. If anything, more stringent legislation on who can own guns should make those who qualify understand how much of a privilege it is to own and lawfully operate firearms in a country that is plagued by their misuse. Access the full transcript of the president’s speech here. Next Post Turks and Kurds: How to Curtail Ongoing Violence?